I first checked out The Hares a couple of years ago, after really digging the energy of a homemade demo they gave me. Their shows seemed a little frantic and rough but were promising. Revisiting them a year or so later, they had solidified their lineup and the good stuff was rising to the surface. It was great to see a band of young guys (from San Antonio) who not only celebrated the roots of rock‘n’roll, but also did it with style, swagger, humor and sans the uptight hyper-reverence that many folks approach these genres of music with. I had to have them on the label. Earlier this year they cut the dozen songs on Smoking In Bed at Blue Cat Studio here in S.A. with me and Grammy winning producer and engineer Joe Trevino (Westside Horns, Augie Meyers, Flaco Jimenez). Between Joe’s schedule and my touring schedule it took a few extra months to get it done but I’m more than pleased with the result. I recently asked The Hares songwriting team of Buddy Parland and Harvey McLaughlin some questions about the band. I hope you find them illuminating. BUDDY: The first time I met you, Harvey, was at that Meteors show and it was because we dated the same girl. Not at the same time, of course. HARVEY: At some point, our paths had crossed again and one of us suggested we start jamming on something. When we finally did get together though, it wound up being abut 20% music and 80% drunk talk. It was through that we found out how much we have in common. You both played in a number of other bands before The Hares. Tell me about those. BUDDY: When I was younger I played in a psychobilly band called the Ghost Stories, then started a band called the Sewer Surfers (not my choice on the name). They were good stepping stones to learn how to write music and get to how I play now. HARVEY: I played in a horror surf band, the Sandworms, for many years. That was like clown college for me. In addition to playing with battle-hardened musicians from the neighborhood I'd grown up admiring, it helped me learn the ropes of gigging in an actual band; learning what to do, what not to do. The experience I gathered from that was invaluable. It’s evident you guys have a lot of love for ‘50s and ‘60s rock‘n’roll and R&B. Did you start The Hares specifically to incorporate those styles? BUDDY: We didn't really know what we were doing and we still don't exactly know what we're doing. We're just doing what we know how to do. We're not going for anything, I don't think. I used to classify us as Satanic spaghetti western. HARVEY: Early on we couldn't escape those influences, no matter how hard we tried. I remember saying from the start that I didn't want to play the same old rockabilly crap, but looking back it was so hardwired in our brains that we couldn't shake it. New Orleans R&B and good Southern soul are my bread and butter, so naturally that started to creep in too. It resonates on a different level, it's groovier, so immediately it adds another dimension to what we're doing. How hard was is it to find confederates around your own age to go along with that? BUDDY: It's not like we said 'Hey, you wanna join a rockabilly band?' to anybody. No one really asked how we sounded. We asked quite a few people and there was a lot of big talk, but no one showed up. Everyone wants to join... but you gotta show up first. HARVEY: On top of that, it was more of a challenge to find people who were musically adventurous. It was much harder to find people willing to think outside of that particular box, and not be weighed down by any specific influence. We got very lucky with the people who eventually joined up. There are many acts out there who “ape” classic rockabilly and early rock‘n’roll but don’t really own it. They have the haircuts, the shoes and the gear but, in their reverence for the fashion and sound, end up missing the boat energy-wise. How do you avoid that pitfall? HARVEY: It was never an image thing, like a guy who decides to grow his hair out and start learning Slayer: 'I'm gonna start a metal band.' We just started playing stuff we enjoyed. BUDDY: It's kind of an organic thing. There's a lot of thought that goes into how we construct the songs, but it's never based on a certain genre. We never based our music on what kind of haircuts we had. HARVEY: If anything, the haircuts changed because of the music, not the other way around. Also, along the same lines and, oddly, even among a lot of primarily Mexican-American/Hispanic/however-you-wish-to-be-identified bands that play traditional sounding rock‘n’roll there is a total absence of “blackness,” for lack of a better word. But I hear Little Richard, Fats Domino and Etta James in your music. Why do you think other bands lack this element while you guys clearly have it? BUDDY: We're far from traditionalists. We love it all. We listen to stuff like Leadbelly, or Robert Johnson, as well as current bands. The important thing is to keep an open mind to different stuff. HARVEY: Yeah, I've noticed quite a few of the straight rockabilly cats are adamant about keeping clear of the blues as a style, for whatever reason. I never got that. As a piano player, straight rockabilly is fairly boring. It's just accompaniment. But that R&B stuff, that jump blues stuff, the gospel stuff... the piano is the pulse on it, it feels like. Within the tattoo, burlesque and custom car subcultures there is also the sometimes sinking feeling that folks are celebrating eras that really only ever existed in the mind’s eye. I guess The Hares, to me, are more akin to The Blasters when they first came out. Yes, there is a heavy nod to the past but the music is something living and breathing; something with a future. What makes the difference that gives The Hares a leg in the present? BUDDY: It's not nostalgia for nostalgia's sake. HARVEY: We were fortunate enough to grow up in a time of video stores, flea markets, tabloid newspapers, and drive-ins. It was an America that seemed to occupy a time outside of the mainstream; where, if you loved something, you needed to hunt it down yourself kill it, skin it, eat it, and wear it. Looking back now, it really seemed like a time that only existed in our imagination. Nowadays you jump on a pocket computer and become an expert on anything in the blink of an eye, no matter how obscure. A lot gets lost in the process, it cheapens everything by being too accessible. We may have joined the circus in that sense (you kind of have to in this day and age), but we still cling to the way things were in that time. So, as it pertains to the previous three questions — do you ever feel like outsiders in those scenes while you are quite arguably the highest functioning progenitors, at least on a local level? BUDDY: I don't even know. I'm so out of touch with what other people think and what's happening at a local level. The people who come out and support are people we know by name. To me, that's what's important. HARVEY: People seem to like it, even though they don't know what it is. You get 10 different people giving us 10 different descriptions of why they like the music. BUDDY: But I've never heard anyone say we sound like another band, which is awesome. HARVEY: I like that we're outsiders. Nobody really writes about us. Nobody really pays attention to us. It's a good thing. If you have everyone love you unanimously right out of the gate, falling over themselves to let you know how great you are, something's wrong. BUDDY: We're kind of underdogs. We’ve never really cared about being accepted. BUDDY: JD McPherson, The Jim Jones Revue, Eli Paper Boy Reed. HARVEY: Sharon Jones & the Dap-Kings, Raphael Saadiq. BUDDY: Dr. John's last album, and T Bird & the Breaks. HARVEY: A lot of the local artists we've had the pleasure of playing with here in town. BUDDY: The Ugly Beats. A band called Neighbours from Pittsburgh. If you could share the stage with any one living “heritage” artist, who would that be? HARVEY: A month ago I would've said Bobby Womack, but unfortunately, he passed away. The Blasters, for sure (would you consider them a heritage act?). BUDDY: I think it'd be cool to play for Chuck Berry. 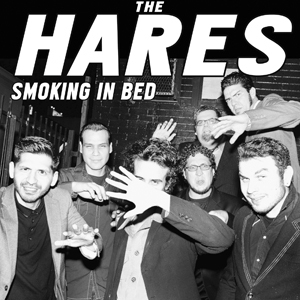 Do you guys really smoke in bed or is that just a catchy album title? BUDDY: I don't even need a cigarette to set the sheets on fire. 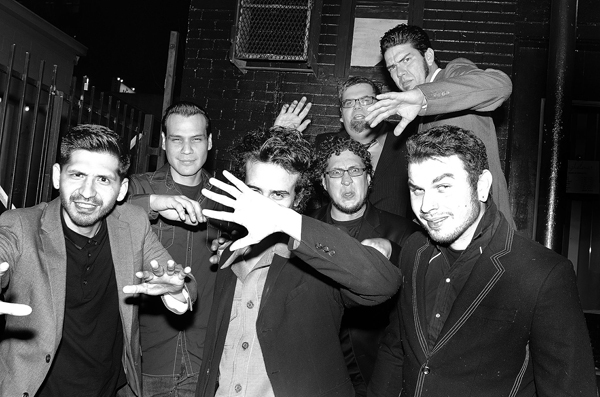 The Hares are a seven piece from the Southside of San Antonio. Their music is evocative of the early greats of rock'n'roll: Jerry Lee Lewis, Little Richard, Fats Domino. And while it recalls that era and has lyrical themes that are timeless it retains the urgency of an overdue baby.